Boredom Abounds: Crafty Lady - A Patchwork Quilt. And an Announcement. Crafty Lady - A Patchwork Quilt. And an Announcement. I've been busy lately. Busier than I've ever been in my life, I think. Which is why for the past few months this blog has been a bit patchy with entries. One of the things I've been busy with is patchwork quilting classes. It's something I've wanted to do for a while, and knowing the basics of sewing I wanted to learn more skills to create quilts for various things. I finished my first quilt this week - what do you think? 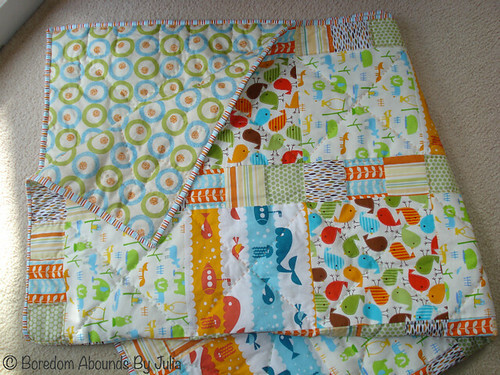 This is a baby quilt, intended for a newborn to lie and play on when on the floor, and when it's a bit bigger it can be a bit of a comfort quilt for the bed or the couch. The retro bird fabric was the first fabric that I chose, then I selected the other fabrics to compliment it. Retro animal prints seemed to become an unintentional theme,with green and orange featuring heavily in the bordering fabrics. I've already chosen my next quilt pattern - this time it will be a quilt for my husband's and my bedroom, so I've definitely caught the patchwork bug! I've been having lessons here, and I can't recommend them enough. 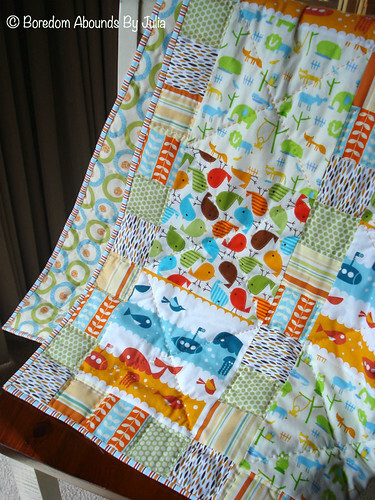 The fabric is fantastic, the staff are helpful and it's just a lovely environment to sew my first baby quilt in! Here at Chez Boredom Abounds we are expecting a baby! Our first baby, to be specific! And it's due in just three weeks. Which is why there have been weeks where posting has been very light - I've had a great pregnancy, and while I was exhausted in the first three or four months, I didn't suffer morning sickness (nausea and extreme food aversions, yes. But official morning sickness? No, thank goodness). But the since Christmas things have been a bit manic, and I was unwell enough in February to have a few days in the hospital for some anti-biotics and rest. Now I'm on maternity leave and enjoying nesting, relaxing and anticipating the arrival of our baby. I don't often reveal much of my personal life here, because that's not what this blog is about. I'm not a mummy blogger and I don't intend to become one, because there are a lot of great parenting and mummy bloggers out there, so I'll let them keep doing their thing! I hope this blog can remain an entertainment/lifestyle blog, and while we will announce the baby's birth, I'll continue to keep the focus of Boredom Abounds By Julia on books, movies, TV and other stuff. Other stuff may occasionally include baby related stuff, but my husband and I will try to keep our personal lives private. Still, I wanted to announce our exciting news because all of my readers are so important to me, and also because if I disappear at strange intervals it's because my attention will be focused on bonding with the bub. And also trying not to lose my mind from sleep deprivation! As always, I thank you for your continued support of Boredom Abounds By Julia and I hope you keep reading! So, that's my news. How you doin? That quilt is gorgeous! I've loved that whale print for ages now. I have just bought and cut the makings of my first quilt, it's to be an experiment before I start on a baby quilt for friends who are expecting their first. Fingers crossed it comes out half as nice as yours (it actually requires you to deliberately not sew straight which I'm having trouble getting my head around :)). Heidi, thank you so much! We're very excited! CheezyK, patchwork is an addiction, especially when there is cute fabric like this around! Good luck with it! And don't worry, mine has lots of little mistakes, but if you don't look too closely you can ignore them! Thanks Nat, we're very excited! I'm so happy for you, Julia :) Congratulations to you both. To be honest, I am so glad you're not turning Boredom Abounds into a mummy blog. Do you know how rare that is? My first quilt was a baby quilt too. I really love the colours you chose. And that you have the bug now! Oh Kiki, I definitely have the bug - I think it's all the gorgeous fabrics! Thank you for the good wishes, it's much appreciated! Glee Highlights post - Episodes 10, 11 and 12!